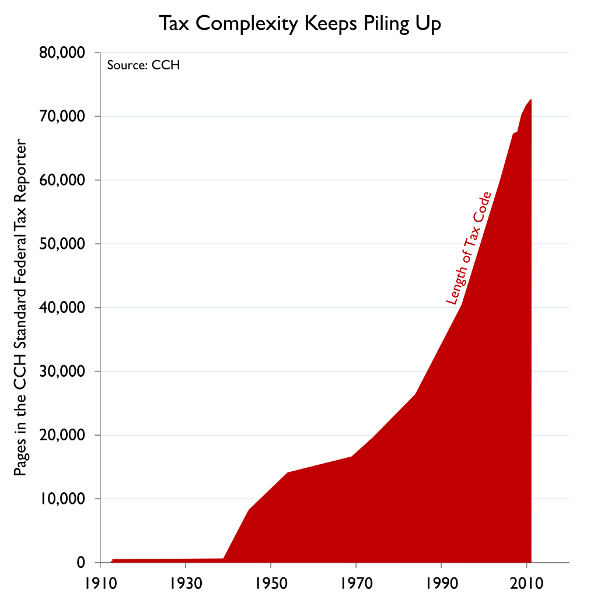 Over the years, the tax code has been altered by changes to statutes, regulations and case law, adding up to over 70,000 pages of instruction to filing taxes. It is the IRS’s job to enforce tax policy, so they keep track of the time and cost of filing taxes for individuals and businesses. Tax filers face the task of understanding IRS instructions in order to comply with paying taxes. According to the IRS, filing taxes will take taxpayers an average of 8 hours and cost $120 for each nonbusiness return. An IRS publication shows nearly 169 million individual tax returns (including all individual tax forms and estimated tax forms) were filed in 2012, costing over $20 billion in compliance costs. This is not the cost of actually paying taxes, but only the cost of filing. The time consumption is further burdensome to individual tax filers. Considering 8 hours each for 169 million returns, Americans spent over 1.35 billion hours filing individual taxes. The IRS states that business returns will take an average of 23 hours to file and cost an estimated $420 each. Businesses in the U.S. filed over 10 million tax returns in 2012. Assuming the IRS’s estimated $420 filing cost holds true, over $4.4 billion was paid in compliance cost by businesses and non-profit organizations. Again, this does not include the actual tax burden but only the cost of filing. For those 10 million returns, the IRS estimates it will take on average of 23 hours to file, equaling nearly 240 million hours of filing tax returns. Business and organization also face additional compliance burdens not dealing with income tax filing. An independent study found that when including labor taxes and consumption taxes with corporate tax filings, the average time for businesses to complete all taxes increased dramatically. Labor tax compliance alone cost businesses an additional 55 hours. The IRS reported that nearly 30 million employment tax forms were filed in 2012. This adds an additional 1.65 million hours. Maintaining the same $420 IRS estimate, this cost firms an additional $12.6 billion in compliance costs. All said, Americans spent over 3.24 billion hours, which is about 369,858 years, preparing and filing tax returns in 2012. Considering individual, business and employment taxes, this costs $37 billion annually in compliance cost for federal taxes alone. Additional time is spent filing state taxes each year. For most states, the number of expenditures (deductions, credits, exclusions, rebates and other provisions) tallies into the hundreds. Each of these expenditures cost more time to file and many must be verified by state officials after returns are submitted. A simpler, transparent tax system can greatly reduce the cost of compliance for U.S. taxpayers. A complicated tax system creates not only a huge time and money expenditure for taxpayers, but also for government officials verifying returns, which can lead to higher tax burdens later.